Our Uppercase Single Letter Vine Monogram comes unfinished. All products ship within 2-7 business days. Our unfinished wood cut-outs are crafted of a high quality cabinet grade MDF. All products are cut in-house on our CNC routers and are hand-sanded, smooth to the touch. We recommend using an acryllic paint on our unfinished products. These paints can be bought at Wal-Mart, Home Depot, Hobby Lobby and other stores. A keyhole mount is provided for items 12" and larger. We recommend command strips for smaller cut-outs. All products cut on 1/4" MDF are weather resistent and suitable for outdoors. We love taking custom orders! Any sign or logo can be custom made for your business or home. Call 1-855-992-7677 or email support@Build-A-Cross.com for more information! Great quality product, exceptional customer service, highly recommend! Very happy with the items I have ordered. Great quality and fast service! Repeat customer here! The letters were exactly what I was looking for and arrived very quickly post order. I would definitely rate Build A Cross at a 10!! Good quality product and super fast shipping. 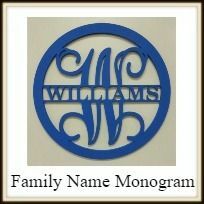 I ordered on a Friday and received my monogram on the following Monday. Scrolls skew what it looks like. I like the scrolls included with the letters but I purchased an "&" sign and the "scrolls" of decoration make it look like a decoration more than an "&" sign.